Dory met with the property owner to confirm whether or not this was a new cemetery, or the long lost #15. 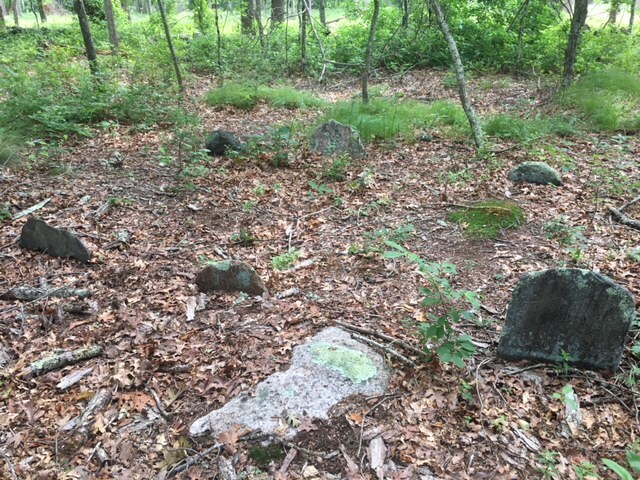 She said that even though it is a bit south of an area she felt may have been #15, this one has the correct number of field stone graves. She will research some deeds, clean the stones for inscriptions, and run it all by Lauri Arruda, expert on and author of the newly published Richmond Cemetery Book. Dory had taken Lauri to what she thought was #15 a while ago but found no graves there. She feels that site is probably a cattle pound and has a great stone enclosure. Anyhow, Dory said that is how Lauri wrote it in her book. According to Dory, the town tax maps are wrong for this and a lot of other cemeteries in Richmond. She knows the corrections need to be made at the town hall and she is hoping to tackle this project in the future. Per Dory, “it’s NOT official but I think this is the more accurate location of #15.